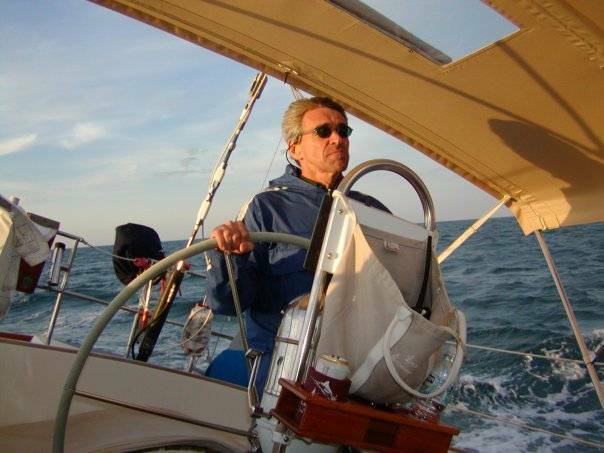 Lee Messina, CPYB aboard his Morgan 321 Cutter, "Alchemy"
In the glorious life of boating, there are many daily quirky habits we adopt that set us apart from our land-dwelling counterparts. But it’s more than just possessing an extensive nautical vocabulary or knowledge to navigate the high seas. It’s a complete state-of-being in which work deadlines can seem meaningless, lazy days in front of the TV seem fruitless, and the phrase “It’s 5 o’ clock somewhere” is more than just a song, it’s a way of life. It’s these little intricacies that make up the boating lifestyle and in turn develop our philosophy on life. One way identify these intricacies is by completing the sentence “You know you’re a boater when…“ Try it yourself and discover all the subtle details that make your life unique as a boater. …all your shoes r made by Sperry. …you call all ropes “lines” and bumpers “fenders”. …2 miles per gallon is exceptionally good mileage. …you are always sunburned on Monday morning. …you give direction using Port and Starboard rather than Left and Right. …when you often think “This would be a lot more fun out on the water“. …you always notice which way the wind is blowing. …you don’t go to the bathroom, you “hit the head”. …you consider leaving a water tap running longer than a couple of seconds a crime. …you would rather anchor in a cove for a weekend than stay in a fancy resort. …many of your everyday decisions are dependant on the weather. …you would pass a restaurant on the water while driving, so you can go home and return to the restaurant by boat. …your stress level is lower than all the non-boaters in the office. …when you spend more time in the office thinking about where to cruise for the weekend than you do actually working. …your music collection consists of Jimmy Buffet, Crosby, Stills & Nash, Neil Young, The Beach Boys, or Bob Marley. To all our fellow boaters, we want to hear from you! You guys nailed my favorite one – directions in Port and Starboard. I do that all the time. Just this morning as a matter of fact, when telling the Ford Mechanic which door handle needed to be fixed, I uttered “the por… uh, the driver’s side” 🙂 Great list!